Arts patron and philanthropist Sir James Wallace funds two scholarships and a prize to support creative writing in the Faculty of Arts. Two Sir James Wallace Master of Creative Writing Scholarships are awarded each year to incoming Master of Creative Writing (MCW) students, based on the strength of their application. At the end of the programme, the Sir James Wallace Master of Creative Writing Prize is awarded to the writer who has produced the best portfolio of work. The scholarships are valued at $3,500 each, and the prize is valued at $5,000 — New Zealand’s richest prize for a creative writing student. This year the two scholarships went to Cybonn Ang and Angelique Kasmara. The convenor of the MCW, Paula Morris, is very appreciative of Sir James’s targeted generosity. 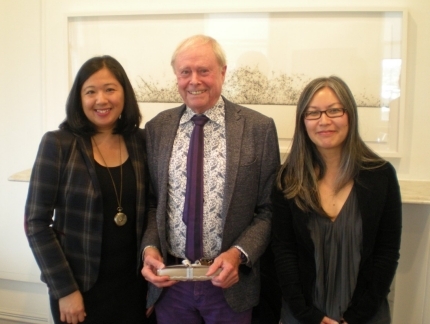 Sir James is steadfast in his support of the arts, and encourages others to follow his lead. This entry was posted in Uncategorized on July 29, 2016 by Paula Green. THE GERRARD AND MARTI FRIEDLANDER CREATIVE LIVES SERIES – some poets in the mix? Auckland University Press are delighted to announce the foundation of the Gerrard and Marti Friedlander Creative Lives Series. This series represents an outstanding act of philanthropy by Gerrard and Marti Friedlander, who have contributed so much to the arts in New Zealand over the years. In a world where funding is precarious, this sort of philanthropic support for New Zealand publishing is hugely appreciated. The Press has now launched the first book in the series, Peter Simpson’s Bloomsbury South: The Arts in Christchurch 1933–1953. This entry was posted in Uncategorized on July 28, 2016 by Paula Green. This entry was posted in NZ author, NZ poems, NZ poetry, Uncategorized and tagged Robin Hyde on July 28, 2016 by Paula Green. Josephine is a tourist and wants to do things spontaneously like go into Jackson McNally and buy Laura Solomon or Short Talks or listen to Frank O’Hara read why he’s not a painter on YouTube, but all she finds is a heartbreaking rendition of ‘Having a coke with you,’ read cigarette in hand, in that melodic voice, American accent dipping and pausing until he asks indirectly, what good is art when all he sees is paint just paint, and his lover all movement, ah such movement and the face, hot beyond portraiture. You need the right person beside the right tree in the right light in the right city and this is love. She hears that and reads of his death. This entry was posted in NZ author, NZ poems, NZ poetry, NZ poetry book, Uncategorized and tagged Frank O'Hara on July 27, 2016 by Paula Green.